OMG this brutal cold is really killing my vibe this week, but I did some fun indoor type activities to share with you here. 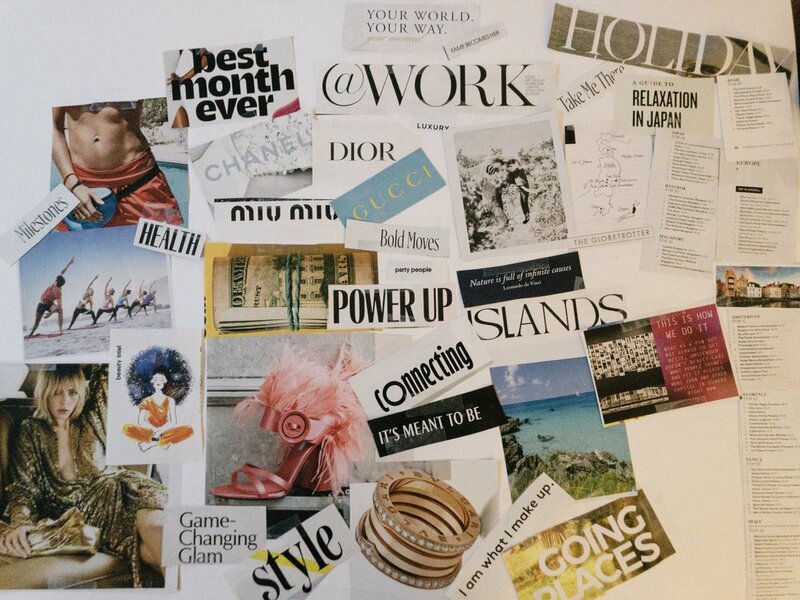 Do: This week I created my first ever vision board. I’ve mentioned before that I have a healthy respect for “woo”, and having read so many books on visualization and the power of vision boards, I decided that this was the year I was going to give them a go. Best case scenario, everything on the vision board comes true, and there really isn’t a worst case scenario, so why the hell not? My vision board turned out to essentially be a list of dream brands, vacations, and moving to Amsterdam, as well as some yoga retreats. Turns out, deep down all I want to do is travel and be fabulous. Shocker. Follow: Speaking of “woo”, I am endlessly entertained by astrology. I share a birthday with Jennifer Lopez, and am a Leo through and through, including the big mane of hair. One of my favorite Instagram pages is one by Co-Star Astrology - I frequently post these in my stories because they are hilariously accurate. Thanks to fellow blogger Alicia Hansen for introducing me to this page. Listen: If you’re a fan of documentaries, take a listen to The Documentary Podcast presented by the BBC World Service. This week I learned about topics like the long-lasting impacts of the French-Albanian war, and the assassination of Pakistan’s first female Prime Minister, Benazir Bhutto. Read: The New York Times exploring the psychology of beauty samples and why we hoard them. Sidebar: I’ve started actively declining samples and cancelled all my sample box subscriptions in an attempt to reduce my use of single-use plastic. Buy: I have no loyalty when it comes to beauty products. For one, I change products seasonally, and second, there are new products released all the time, and I LOVE trying new beauty products. However, there are some brands that consistently make their way back into my rotation, and Swell Skin is one of those brands. Their PR team recently sent me two of their serums to try out, and although I am under no obligation to blog about them, I’m really LOVING their new Hydrate and Radiate serum in this awfully cold, dry weather. It’s the only thing that’s keeping my skin from feeling stretched and dry, and I whole heartedly recommend it if you’re suffering as I am this winter! I love this product, especially in the winter! Local Bonus: If you’re in Cleveland, I hope you’ve had a chance to try out Good Company, the newest restaurant by the Plum Cleveland group. Another beautiful (albeit more casual) space, and excellent food. The wings are amazing, and if you’re vegan, they have a celeriac root “wing” that comes highly recommended. Plenty of options of vegetarians and vegans across the menu. Also, the cocktails are delicious and very Instagram-worthy. Hope you have a super fun weekend!